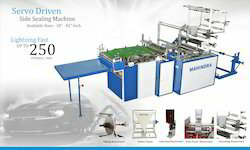 200 Bags / Per Minute Servo Driven Side Sealing Machine. This product is highly appreciated for its accurate indexing and micro processor control with digital display. This product is manufactured using latest machinery and advanced technology, to ensure high standards of quality. 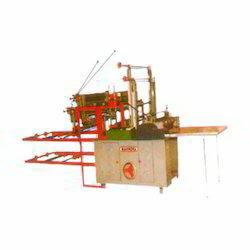 We offer high quality of Servo Driven Double Decker Sealing and Cutting Machine. This product finds applications in many industries for effective bag sealing and cutting. This product uses double cutters that are ideal for making plain bags and T-shirt type bags. This product is known for its dimensional accuracy and compact design. This product is available at cost effective market price. This product is fully tested before being dispatched to our valuable customers. We offer a high quality Automatic Bag Sealing & Cutting Machine with Mechanical Clutch and speed of 70 strokes/minute to our valuable customers. This product is available in standard market prices. This product is manufactured from finest quality of raw materials that are sourced from well known vendors. 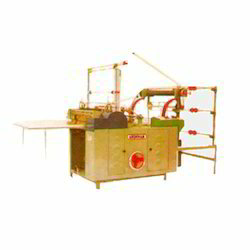 185 Strokes/Minute, Owing to the vast experience in this domain, we have emerged as one of the leading manufacturers and exporters of high quality Servo Driven Bottom Sealing and Cutting Machine. This product is known for its dimensional accuracy and compact design. 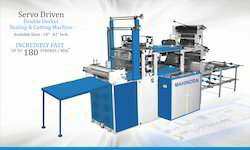 70 Strokes/Minute We are one of the prominent manufacturers and exporters of high quality of Automatic Double Decker Bag Sealing & Cutting Machine with mechanical Clutch. This product finds applications in many industries for effective bag sealing and cutting. This machine is easy to operate thus ensuring perfect cutting as well as durable sealing. This product can be custom made as per the requirements of our valuable customers. This product is fully tested before being dispatched to our valuable customers. 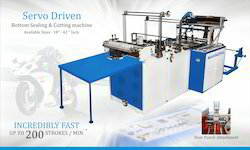 Looking for Sealing and Cutting Machines ?